After about 8 years of operations, KL2R has added over about 60,000 QSOs to our log. Thanks to everyone. It's always a pleasure to work you, whether once or a hundred times. We like to operate. The shack PCs run Windows 7 Professional for its relative stability and ease of administration. We use Win-Test and N1MM, including the MMTTY plug-in, for contesting. DXLab Suite is the main toolbox. Ham Radio Deluxe and DM780 are also used for casual contacts, especially PSK31. 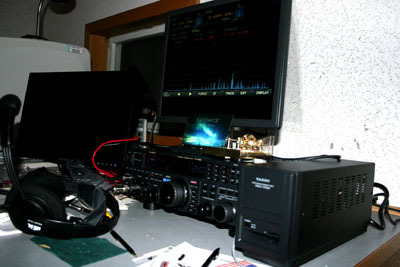 Yaesu FT-950 and FTdx5000MP transceivers now serve as the main rigs. Digital modes are proven on the MicroKeyer II using Win-Test, N1MM, HRD, and DXLab Suite. Many RTTY contests and a few PSK efforts have been a lot of fun. We have had good showings in many contests, especially Sweepstakes, CQ contests, and ARRL DX! M2 and SO2R/SO2V are possible depending on demand and interest.